they're healthy and delicious. they make good use of an abundant summer vegetable. they're good to nibble before dinner, or as an accompaniment to your grilled burger. they almost beg to be eaten outdoors, on a warm evening. 1. preheat the oven to 450 degrees. coat a baking sheet with cookie spray. 2. cut the zucchini into 1/4 inch thick rounds. in a small bowl, combine the parmesan, bread crumbs, salt, and a few turns of pepper. 3. dip each round into the egg white, followed by the parmesan mixture, coating evenly on both sides. place in a single layer on the prepared baking sheet. 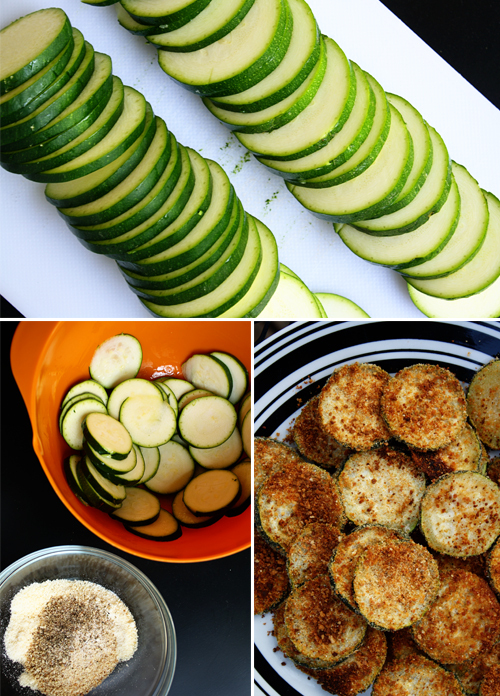 4. bake the zucchini rounds 10-15 minutes. remove from the oven and flip rounds with spatula. bake for an additional 10-15 minutes, or until browned and crisp. serve immediately.